Environmental Conditions Affect Air Pollutant Degradation (February 22, 2016) summarizes our recent 2016 paper published in Physical Chemistry Chemical Physics, showing that low temperature and humidity slow down photochemical reactions. Scratching the Surface: Studying Sea Spray Aerosols at EMSL (December 21, 2015) featured our research in the Arctic on the CGSS Amundsen. Paper published in Nature: A marine biogenic source of atmospheric ice-nucleating particles (September 2015): A team of international researchers including members of the Bertram Group receive press coverage for their Nature paper that showed that phytoplankton waste in ocean spray could trigger ice formation in clouds. News articles that picked up the story include: BBC, Sciencedaily, Myscience, Europa, Eurekalert, and Stonybrook University News. Probing Aerosols One By One (March 31, 2014): Methods reveal the chemistry of individual sea spray and mineral dust aerosol particles (From Chemical & Engineering News). 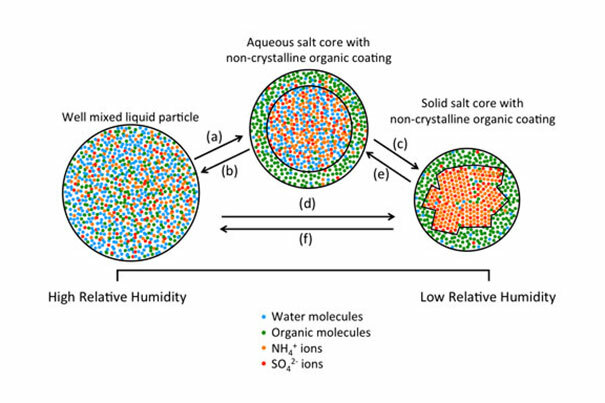 This article featured our research on how changes in relative humidity can lead to phase transitions within individual aerosol particles. This paper has been highlighted in several other online magazines (Environmental Protection Online, EScience News, Eurekalert, Harvard Gazette, Phys.org, R&D Magazine, Science Codex, SciTec Daily, and ACCN). The original paper was published in the Proceedings of the US National Academy of Science. Advancing the Field of Atmospheric Sciences (July 2012) The atmospheric aerosol program, CREATE-AAP, led by Professor Allan Bertram is highlighted in International Innovation. Investigating Climate Change. The Anatomy of Atmospheric Aerosols (2005) The research of Professor Allan Bertram is profiled in Synergy – The Journal of UBC Science.